10,000 Copies of My Book Sold in One Year. How the Heck Did That Happen? A year ago, I published my first science fiction novel, Where the Hell is Tesla? I had the high hopes of selling a thousand copies, though I secretly wondered if I’d ever get past a few hundred. And today, I stand at 10,000 copies sold in the first year. Depending on your measure, that’s a bestseller book. Whew! To answer that question, I’d first like to introduce you to Tim Grahl. He’s a book marketing expert who’s helped New York Times bestselling authors for years, and has published a couple of books of his own to guide authors like myself: Your First 1,000 Copies, and Book Launch Blueprint. I’d have to say that other than making sure the quality of my work was its absolute best (which I’d hoped readers would respond to), the key to my book’s success were following the advice from Tim’s books, blog posts, and online classes. Sounds obvious, I know. But I think it’s important to list this because: you have to really believe in your work, believe that you really know how to write a book, in order to email, sell, pitch, beg, harangue, and constantly reach out to people for a solid year on its behalf. Where the Hell is Tesla? took me the entire previous year to write, and I poured my soul into its creation. And a note about editing: I originally released the first two parts as serial stories, like Hugh Howey originally did with the Wool series. And lots of the feedback I got was about little editing errors. So I learned a huge lesson before selling even one copy of the full novel – the product itself has to be bulletproof. Editing, spell-checking, formatting, consistency, everything. I believe all the marketing in the world won’t help a product that’s not ready to launch. 2. I set up my “platform:” website(s), social media, Amazon pages, and email list. Tim Grahl defines your platform as whatever plan and method you use to connect with readers and sell books. In my case, considering the nature of my job, I couldn’t consider traveling or touring, and simply didn’t have the patience to find a publicist that would actually respond to this first-time author, so I chose the online-only path. The website: I’d tell you all about how to build your own in an hour, but Tim Grahl has already done that. So if you need to, check out his post and go to town. For my book, I use Goldfinch Publishing and RobDircks.com to help promote it, both WordPress sites. Social media: I’ve heard many people advise this and I’ll tell you the same thing: don’t overdo it. With a full-time job, and writing and publishing on the side, this book promotion thing was at times testing my productivity limits. So I stuck with just Facebook and Twitter, and I’d say go with the one or two that feel right for you. For example, if you’re creating a graphic novel — very visual — maybe Facebook and Pinterest would be your thing. Journalist writing non-fiction? Twitter. Try them all out and see what feels right for you. Amazon author and book pages: I could get very detailed, but here’s the quick: Use every space Amazon gives you. Don’t leave things blank. Put plenty of key phrases in your book description and keywords list on your book sales page on Amazon. Hook up your author page to show your latest blog posts and tweets. Use what they give you. Email list: I’m having a tough time with this one. As a new author, getting people interested enough to take the ride with you through emails it an uphill battle. But I’ve started blogging, posting, tweeting, and emailing, and my list is slowly growing. I use MailChimp to manage the email list and campaigns. It’s an excellent tool at an excellent price: free. I may still post a crash-course on how to publish a book, to self publish your book for print and digital editions, but there are a million resources out there that explain how to do it already, so I may never add my own to the heap. Of course, if you’re not the self-publishing type, that’s sort of the reason for Goldfinch Publishing. Contact me and I can help you edit, publish, and promote your book. Even if you want to do it completely on your own, I’m here to help. Another note about Goldfinch Publishing. It’s surprisingly easy to set up your own “imprint,” if you desire. For me, I LOVE the production/promotion end of self publishing, so I decided to create Goldfinch Publishing not only to give my own books a credible publisher name, but to offer other authors help in publishing their books and selling their books. It’s in the infancy stage still, but I’m having fun, and we’ve already got some books and media out there selling! 6. I enrolled in Amazon’s KDP Select to take advantage of Countdown Deals and KU/KOLL. • Timing and pricing: Every three months, your KDP Select agreement renews, allowing you one Countdown Deal during that term. So within this first year, I was able to run four of them. Each time, I took my normal price, $3.99, and discounted it to $0.99. • Online advertising (paid): All the major online services offer advertising. So at one point or another in these promotions, I’ve tried all of them. Overall? I’d say if you’ve got the stomach to spend money that isn’t returning as high a value as the email blast promotions listed above, but want to boost your exposure temporarily, then go for it (in an affordable way). For each of these, you can set a daily budget not to exceed, a start and end date, and live monitoring of response. I set my daily budgets at between $5 and $20 per day for a week. Promotion Spreadsheet for Where the Hell is Tesla? Unsurprisingly, the four largest spikes were during these Kindle Countdown Deals. 7. I gave copies to motivated readers and high-value reviewers. My goal this year wasn’t to give away free copies, and mostly I’m not sure what they do for me, as a free copy of anything, in my view, has very little value to the recipient. But the Goodreads Giveaways are great. The site is for serious readers and authors, and you will get thoughtful reviews, likes, friends, and even enough of a rapport to get some fans onto your email list. And when one of these Goodreads members posts a review, all their friends see it. 8. I relentlessly pursued book reviews and exposure. This one kind of worked. If you read Tim’s book Your First 1,000 Copies, and put it to work, you’ll do better than me. But luckily, a few things have dropped into place, and I’ve been interviewed for a few websites, written a guest post, and had several active reviewers review the book for their site. I think the super-quick on this is to find people you know, or second-degree connections, or good targets, who have an audience of their own. Make the right request to them, and give them something that makes it easy for them to help you, like guest posts, podcast participation, and interviews. As noted above, for launch I contacted 75 people I know to provide advance reviews on Amazon.com (25 eventually did). At the end of the book and audiobook, I have a clear call to action, asking specifically for a review on Amazon or Audible, noting that it’s the best way for independent authors and authors with small publishers to gain exposure and help sales. I looked up reviewers on Amazon, Goodreads, and Audible on an ongoing basis, and actively reached out to these individuals to provide a review in exchange for a complimentary copy of the book. Many people took me up on this offer. 9. As soon as I was eligible, I joined the SFWA (Science Fiction & Fantasy Writers of America). I’m now able to say I’m a SFWA member (and believe me, I put it everywhere). In the science fiction community at least, membership to this organization lends a certain amount of credibility. One needs to be a professional author with a baseline amount of financial success to be a member, so for a reader it cuts down the risk of trying me as a new author if you know I’ve already passed some form of test. The organization is incredibly helpful with things like: identifying opportunities to get interviewed; how and where to sell short stories; contracts for authors; and answers to so many questions on their very active forums. This one’s kind of funny. I really created the audio book just to see if I could do it, and to make my Amazon book page look more complete. But boy was I surprised! It has sold way more than I expected, with no direct promotion at all. (Although I did offer free audiobook codes on Goodreads.com and got a terrific response. Have I mentioned that Goodreads is great?) If you’re interested, here’s my post about how you can produce your own audiobook. “★★★★★ You Need This Book. Witty, well written, and completely enchanting. Dricks balances mad-cap crazy with a sincerely and honesty that tire the story together. I was sad to say goodbye when it ended. A very special book and the author’s narration is fantastic. Listen. Listen now. 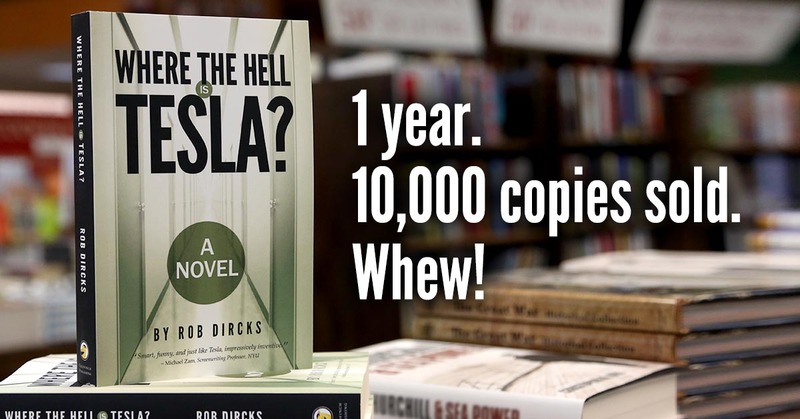 Then, seven months after I released the audiobook, an amazing thing happened: Audible.com selected Where the Hell is Tesla? for their “Hidden Gems” sale for November. This was HUGE, accounting for the single biggest spike in sales for the entire year, (I can’t overstate how important this was to overall sales of my book) and garnering me hundreds more positive reviews for the audiobook. Now, before you think “well, that was just dumb luck,” I’d offer that without all the teeny-tiny little steps I took leading up to that moment, without all that integrated work of the previous seven months, it’s likely that the person at Audible who included me in that sale would never even have known my book existed. I’m learning: every little thing you do for your book counts, and you never know how it might manifest. And if enough small things come together, you could have a bestseller book. And that’s it. (As I said above – Whew!) I’m about halfway done with my next novel, and am now learning how to juggle writing and promoting simultaneously. I’ll let you know how it works out. I hope you find this post helpful. If you have ANY questions at all, or input to make it better or more accurate, feel free to contact me.